Okay, yes, a second potato recipe in a row. I can explain! Steve and I just recently got a Costco membership, where everything comes in containers of near lifetime supply if you’re only two people (I’m particularly thinking of those giant ketchup bottles at the moment!). I keep coming across stuff that I only use sometimes… or rarely… but they’re so much cheaper in bulk! Clearly it would be ridiculous to pass up this fantastic deal. Yes, I should definitely buy an 18 pack of aerosol cheese, a steal at 29 cents a can, which will really help in the event that… I have to fight off… rabid… vegans? Well, okay, no. (I’m not even sure I can associate with aerosol cheese buyers in the first place.) But I do often end up with a lot of new items in my titanic shopping cart. So now we’ve got this giant block of cheese the size of, like, an infant; nearly a palate of bottled iced tea; 4 pounds of strawberries; I don’t know if I even want to say how much coconut oil I just bought. Can one bathe in coconut oil? Can you smell that crackly browned cheesy goodness yet? Hey now. This is not to say I buy things wastefully. After all, no wasting is kitchen rule #34! You know... If I actually numbered such things. I just opt to get more creative with my recipes. Remember Summer Squash Quesadillas and Strawberry Banana Bread (um- soon to be posted)? I give due credit to Costco-haul inspiration! Anyway, before we get too off track – I totally never do that – I’ll bet you realize that potato recipe #2 (of the inevitable #3 to follow) is due to another way-too-big sackapotatoes for me to tackle. But that’s the fun part! 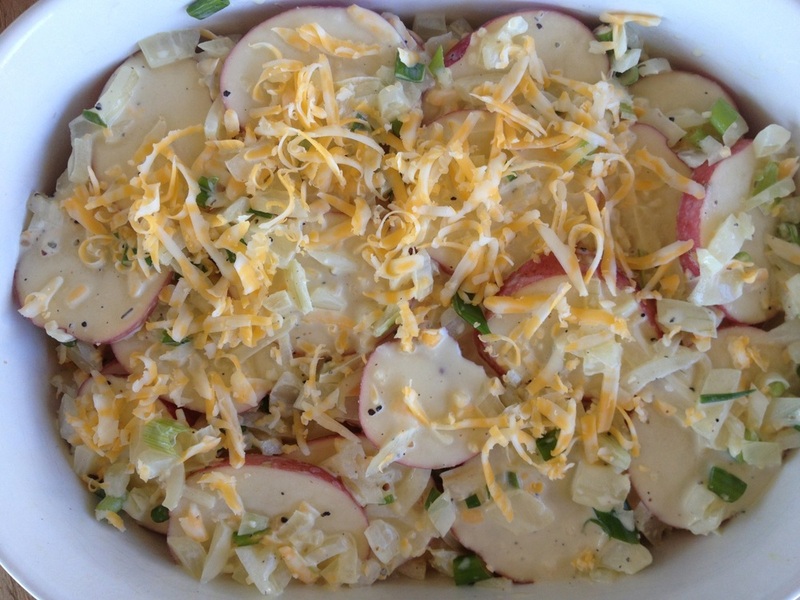 I don’t usually buy potatoes, and when I do, it’s usually for something I routinely make, like potato salad. This time, I had room to indulge my whimsy a little, so I decided to create something… indulgent. Cheese-covered-potatoes are the epitome of comfort food, and no dietician would ever dream of recommending this as diet fare. With the bucketfuls of cheese, butter, and heavy cream on the ingredients lists of most recipes, I wouldn’t blame ‘em! 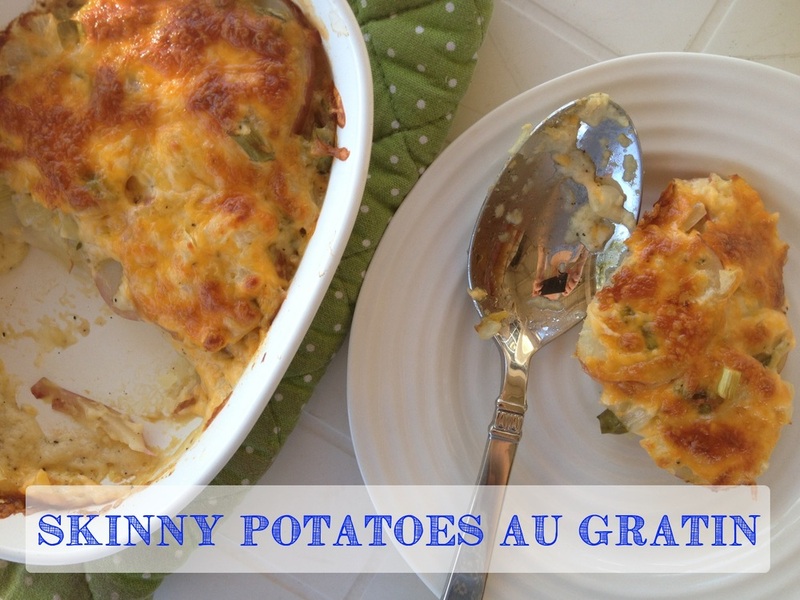 But these cheesy potatoes – wait for it – have no butter OR cream, and are more nutritionally balanced with extra protein! You know what? They taste just like the ones I’ve always had at Thanksgiving and summertime potlucks. 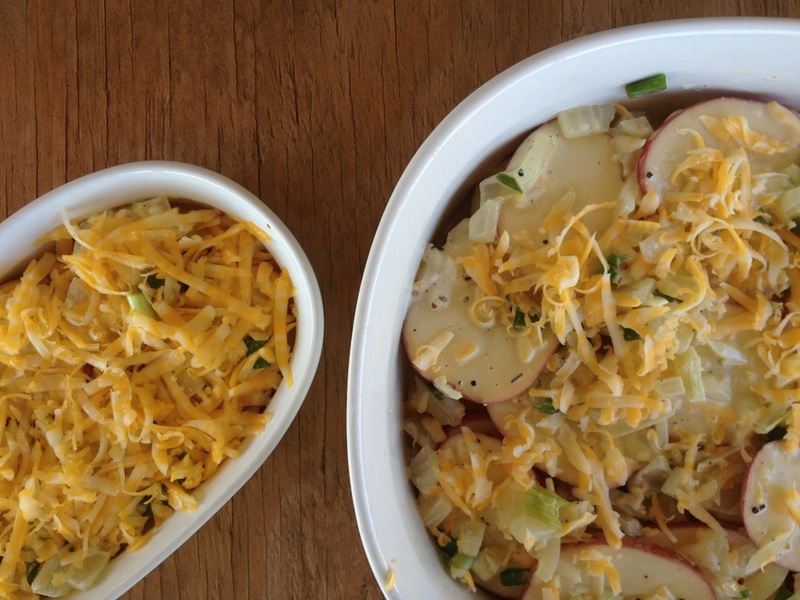 So if you want the cheese and potatoes but not the clogged arteries, just give in… and try this healthified recipe! In a medium bowl, combine all ingredients from Greek yogurt through nutmeg. Spray a frying pan well with olive oil and bring to medium heat – a piece of onion should sizzle when dropped into the pan – and sauté the diced onion with salt and pepper for 2-3 minutes until slightly translucent. Add the minced garlic and sauté for one more minute. Turn off the stove top and move the sautéed garlic and onion to the bowl with the yogurt mixture. Mix in, along with 1/3 cup of the Colby Jack cheese and the chopped green onion – taste test for seasonings + add more of anything if needed. Spray a rectangle casserole dish, about 11 by 8 inches, more or less, with olive oil cooking spray. Layer half the sliced potatoes evenly on the bottom of the casserole dish, and top with half the yogurt/cheese mixture. Repeat with the remaining potatoes and mixture. Finally, top evenly with the last ¾ - 1 cup grated cheese and cover with a sheet of tin foil to keep the cheese from over browning. Bake 40 minutes. Remove the tin foil at this point, and continue baking another 30 minutes, or until the potatoes barely resist a toothpick or fork and the cheese is browned and bubbly! I wanted to do a test bake to see if the recipe was delicious (it was!) and to take pictures of the final product while there was still daylight. So I ended up making one small ramekin (6 x 3”) of extra potatoes, while I saved the large one in the fridge to bake that night. The small one took about 50-55 minutes (I took mine out a little too soon at 46 minutes, and it needed another 5 or so.) I also found out that this makes a great make-ahead dish! You can almost smell the oniony cheesy potatoes, can't you?